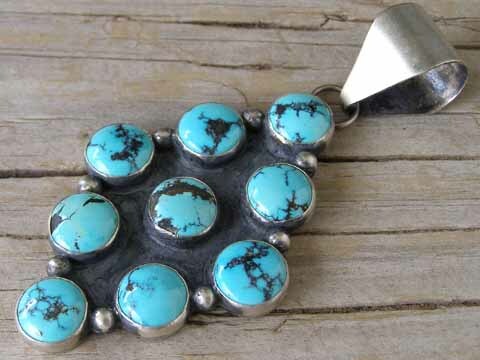 Robert Johnson has been making earrings in this style for over a decade. In fact, we purchased this pendant from him a few years ago and it's been in our stash for at least two years. It's set with nine perfect rounds of natural, untreated Chinese turquoise with a fine coloration and rich webbing in the stones. Hallmarked RJ and stamped STERLING on the back of the pendant. Size of pendant (excluding jump ring and bale): 2 3/8" x 1 9/16"